The following photos were sent to me by Stan Hall. 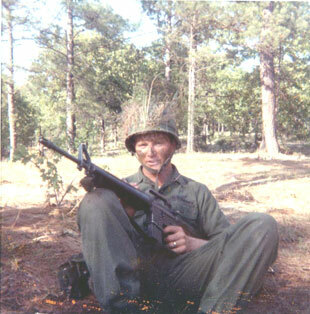 Stan was a member of D company 1st Bn 8th Cavalry 1st Cav from June 1969 to June 1970. (same time I was there). 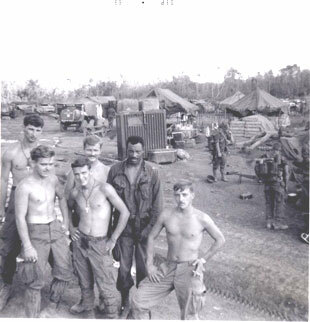 L to R, front row: "Cal", Terry Andresen (KIA), Stan Hall, Steve, maybe Fred. Second row: Ron Black, Kenny Teale, "Beetle" Bailey. 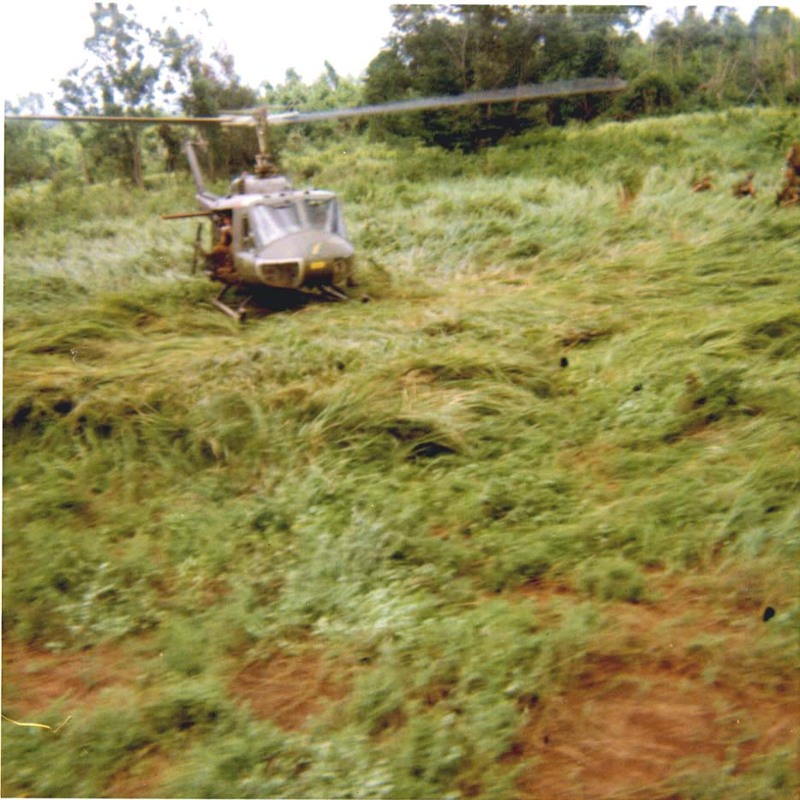 A 1st Cav Huey lands in an LZ. 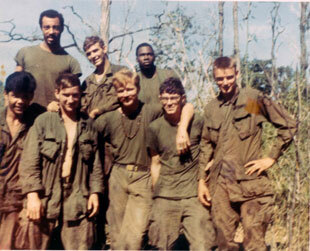 L to R, front row: "Cal", Terry Andresen (KIA), "Beetle" Bailey, Steve, maybe Fred. Second row: Ron Black, Kenny Teale, and Lonnie Hartline*. I noticed Lonnie Hartline in one of the pictures. 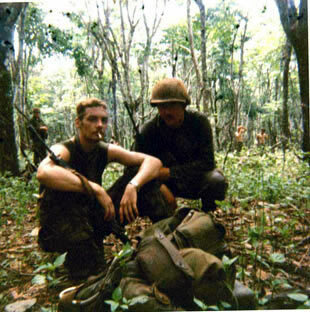 He was in the fourth platoon at one point and his nickname was “Lucky”. 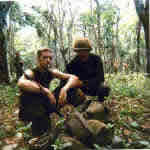 Lucky, I recall, had a reputation for blowing up rats with the Claymore mine explosive caps back on the LZ or the base camp (he would wrap food around them, wait for the rat to get close enough, and then blow it). I heard that he was unlucky at this one night and the cap blew up in his hand and he lost a finger. 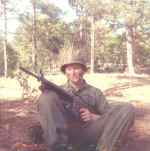 Lucky was possibly our best rifleman at one time, very good with an M-16. 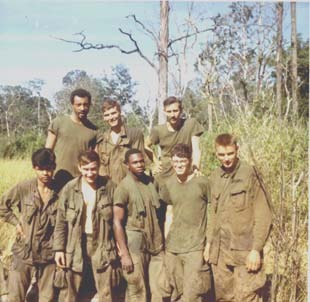 One of my early actions in 1969, probably June or July, fourth platoon was walking drag for the company, I was the RTO and we stopped along the trail. 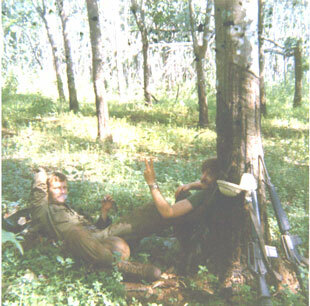 Lucky had his rifle taken apart and was cleaning it, I was brushing my teeth, and the gooks slipped up on us and cut loose. They shot Larry Green, the former RTO who gave me the radio, in the leg while he was nearby taking a crap, think they got him in the calf of the leg. So there we were, I had a mouth full of toothpaste and Lucky had his rifle torn apart. But I do remember that Lucky got that rifle back together in a flash and returned fire very quickly and he may have still been standing up, can't be sure now. Lucky was a natural warrior. Green got his million dollar wound. 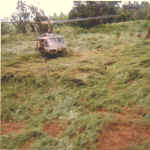 We all envied him, he was the only casualty that day, no one was killed. The two guys in the back row are Stan Hall and Ron Black. Don't know the others.